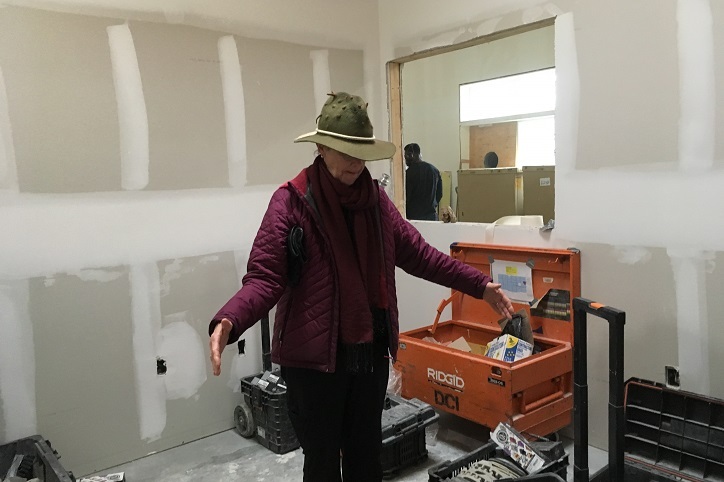 Posted on April 10, 2018 by Kelly M.
Just over two months to go, and the Environmental Learning Center is starting to come together! It has been an exciting month as we move from the large-scale fabrication to the small-scale details. 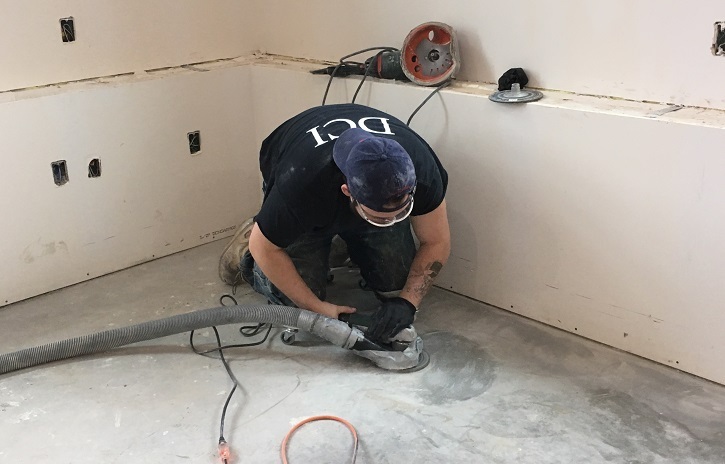 As the snows of February kept falling, the most time consuming task inside was polishing our concrete floors. Every inch was ground and buffed by machines large and small. The result was a beautiful natural gloss on the floor, with an eco-friendly polish on top that will give us many years of wear. We love the rich color that came out in the concrete, and the gradations of tone that add a lot of texture to the space. And it won’t show the dirt of Drumlin from our boots! FurnCom, our furniture selection committee, spent some quality time inside the building determining the sizes and configurations of all of the desks, worktables, chairs, and other equipment that it will take to run our busy education hub. Tia Pinney loves how the small conference room is larger than any private meeting space we ever had in the old building! ColorCom, the color selection committee, has also been hard at work. 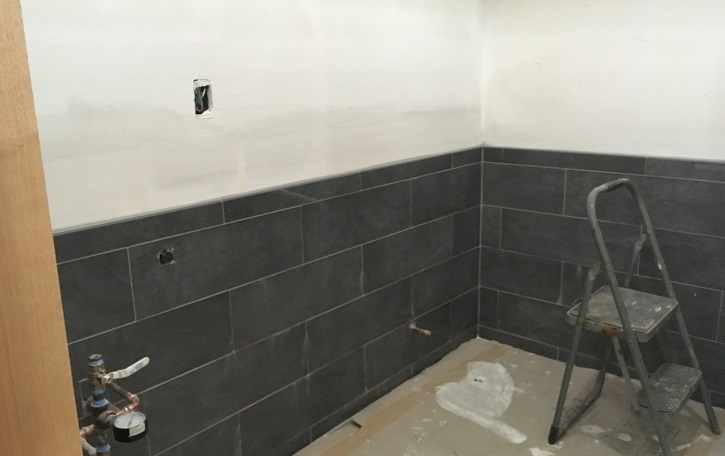 We love the deep gray of the tile they picked for the bathrooms. 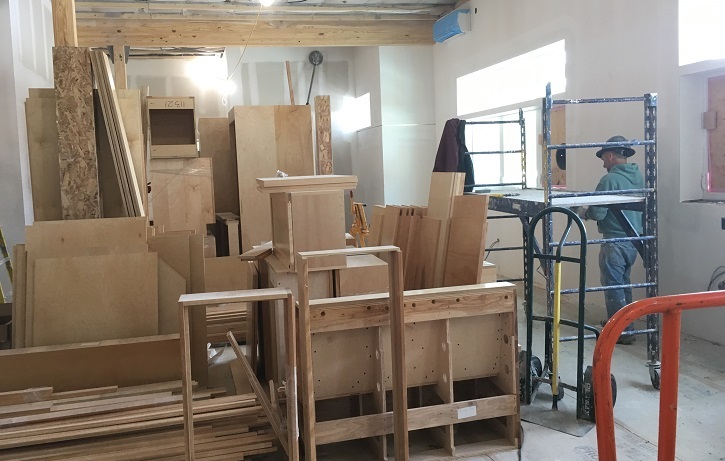 To our surprise, the entire set of millwork (wooden cabinetry) arrived in one gigantic shipment from the fabricator. While it’s a bit of a challenge to match each stick of wood to its rightful spot in the interior detailing, it does make an impressive pile in the great room. Office jenga, anyone? 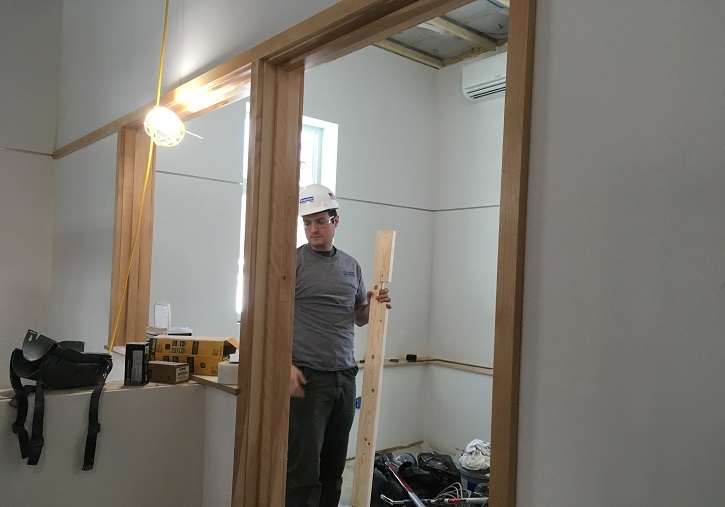 Piece by piece, the millwork has been going up. The birch gives a clean natural look to the doorframes and interior windows. 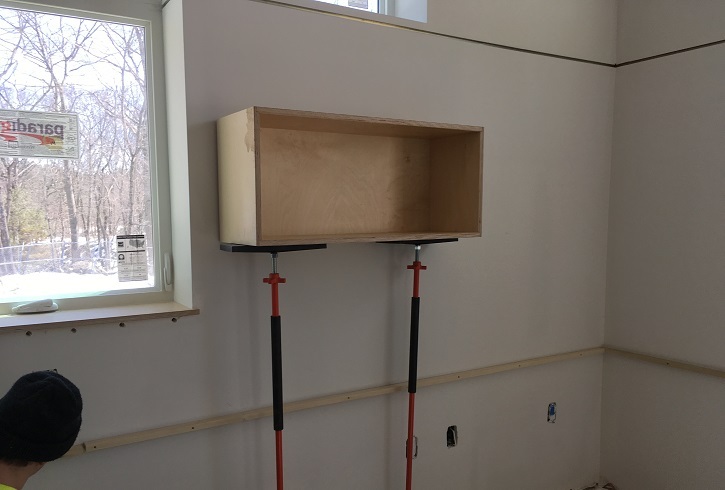 Thankfully our builder understands that some decisions need to be made in situ, such as the exact placement of the box shelves over each workstation. 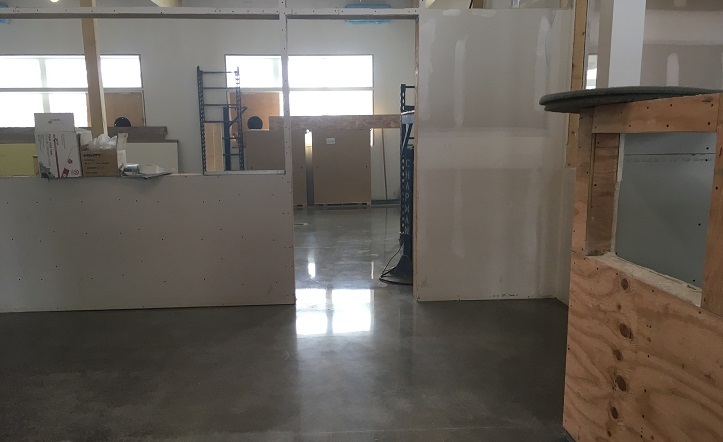 We know we’re a bit fussy on the details, but after waiting so long for this new space, we want it to be perfect! We know our teacher-naturalists are going to love their new storage cubbies! 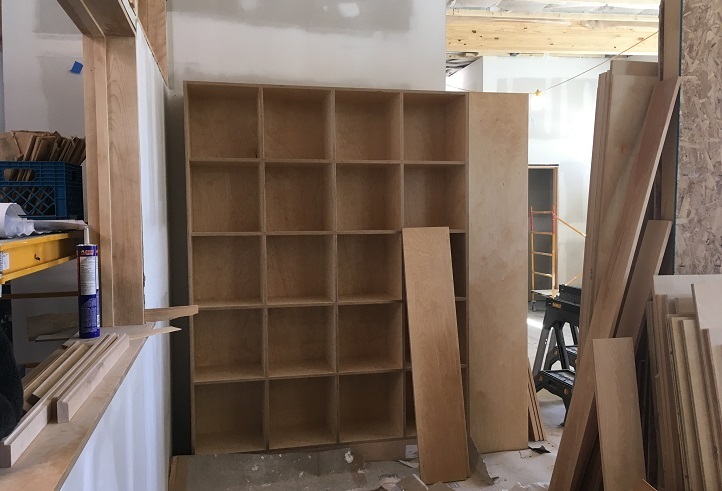 More birch details echo throughout the building, including the bookcases, workstation tabletops, and doors. This entry was posted in Education, News on April 10, 2018 by Kelly M..